The “failure” here is simply a piece of architectural precast concrete that cracked open much earlier in its life than expected. 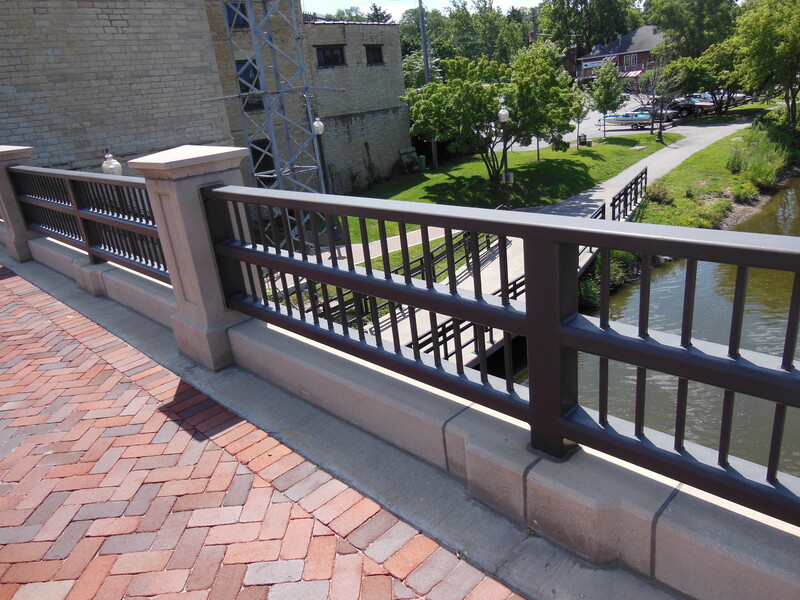 The piece is part of a system of curbs and railings on a bridge. Photos were sent to me and I was able to take a good guess as to what was going on. It seemed obvious; I’d have given odds of at least 8:1 that my guess was right (spoiler: I would have lost the bet). 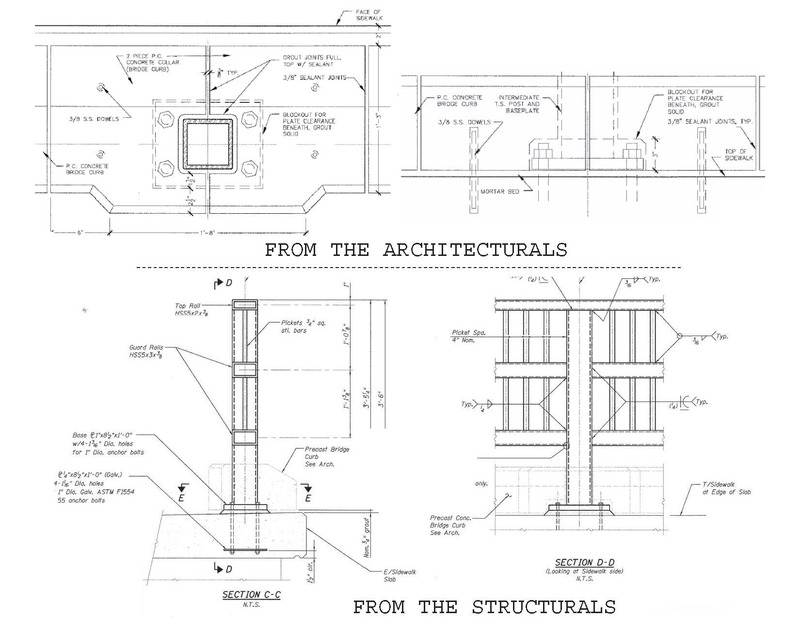 Here’s what the piece looked like on the plans, in real life, and as a failed piece. The bridge is 7 years old; failures started showing up a few years ago. 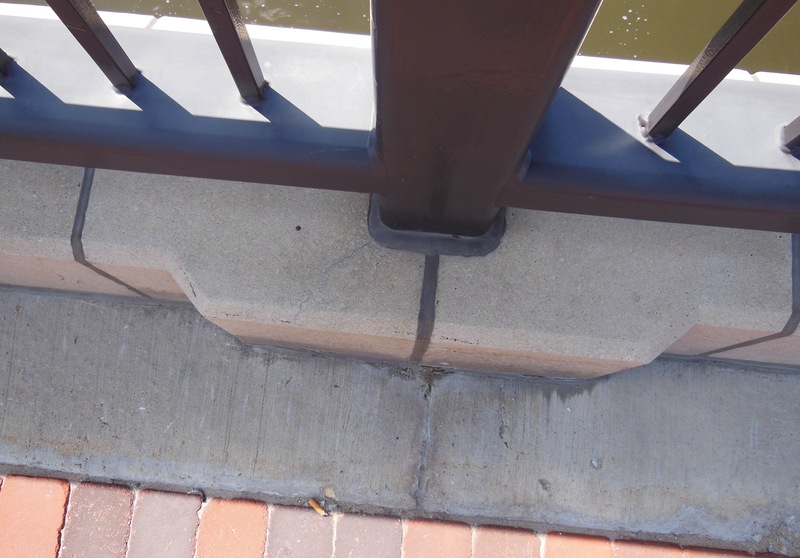 The problem is only at the intermediate piers; there are no significant problems anywhere else on the railing. I knew that the steel post had an anchor plate and was bolted to hot-dipped galvanized anchor bolts cast into the bridge deck and that the tube steel post had some sort of serious coating. 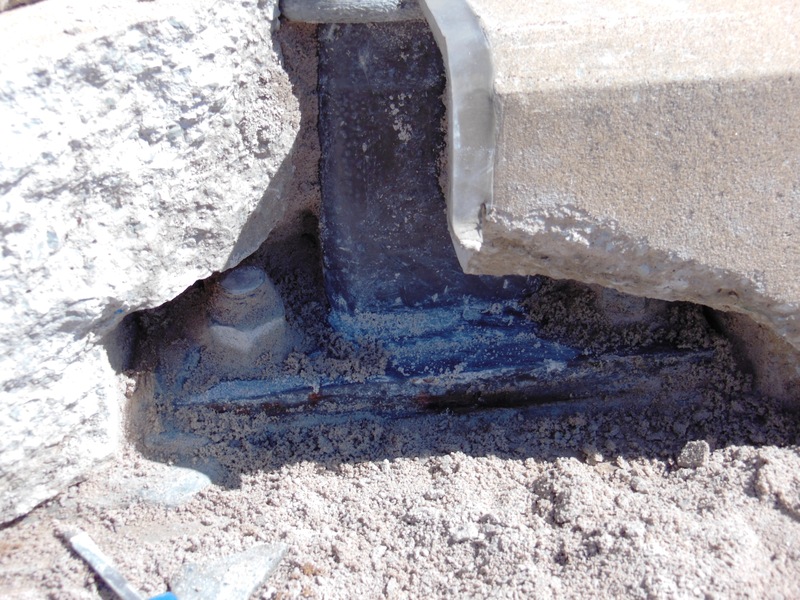 The location and pattern of the cracking indicating a lot of force coming from the cavity where the curb piece surrounded the steel post. My guess was that something was rusting – maybe some non-galvanized bolts were used or the paint on the post had failed or been abraded and was now rusting. In my experience I could imagine nothing else inside the piece that could generate enough force to crack a healthy piece of precast. 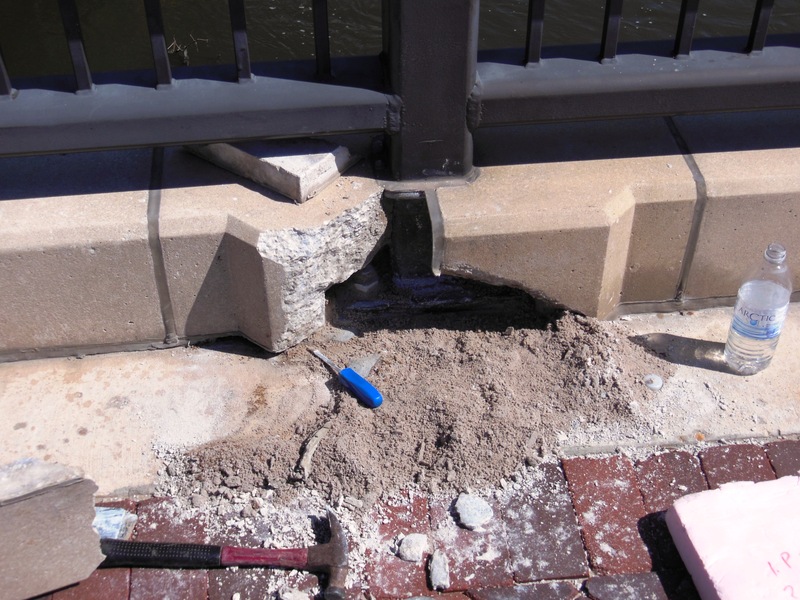 The precast had epoxy coated bar and the crack did not follow the bar locations, ruling out rusting reinforcement. The Quick-Look report (www.quick-look.us is our service for fast, first-look inspections based on photos sent to us) identified some rusting object, probably the plate, as the likely cause of failure. After getting the report based on the photos the owner engaged me to make an in-person inspection. They wanted both a more careful look and some advice on remediation. We went, we looked, and we watched as they opened up one of the cracked curbs. To my surprise, all the metal was clean (the tiny bit of rust on the edge of the bolted-down plate was insignificant). The mortar that was used to fill the void formed into the precast to go around the plate and bolts was so crumbled that it might have been just coarse damp sand. It was clear that rust was irrelevant and that freeze-thaw action had turned the mortar into a sponge that once saturated could become a large ice cube capable of generating enough force to crack the precast. 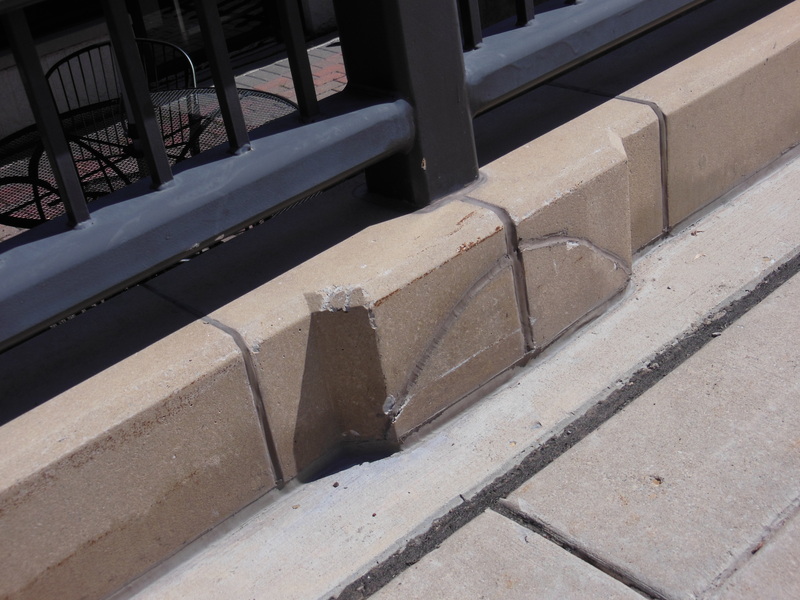 Once the cracking started, freeze-thaw and chlorides (the piece is on the edge of a bridge that is in the middle of the snow-and-salt-belt) did the precast in. This piece has a barely visible early stage crack. Lesson One: Sometimes you have to open up a wall to be sure of what’s going on. Sometimes you will get surprises rather than confirmation. We understand the limits of looking only at what is immediately visible, at what shows up in a photo. True in property inspection and in many other parts of life. More lessons from this inspection in posts to follow. This entry was posted in durability, investigations, knowledge. Bookmark the permalink.